Dr. Gallus and Dr. Douglas discuss treatment of skin conditions using Intense Pulse Light (IPL) therapy. A must see for anyone with brown spots, acne, or an uneven complexion. Hi, I’m Dr. Trent Douglas at Restore SD Plastic Surgery, and I’m joined today by my partner… Dr. Katerina Gallus. To talk to you about IPL. Intense Pulsed Light, or IPL as it is known, represents a variety of treatments for skin conditions raising from age spots to acne. IPL targets specific pigment colors based on the crystal filters that are used. It’s very effective in treating red and brown areas. IPL is an in-office procedure that takes 20 to 30 minutes, and is done in a series of three to six treatments, spread out over four to six weeks. You may look pink and have dry, flaky skin for a few days after your treatment. You’ll need a good sunscreen during recovery. Best results are obtained when combined with a medical grade skincare regimen. 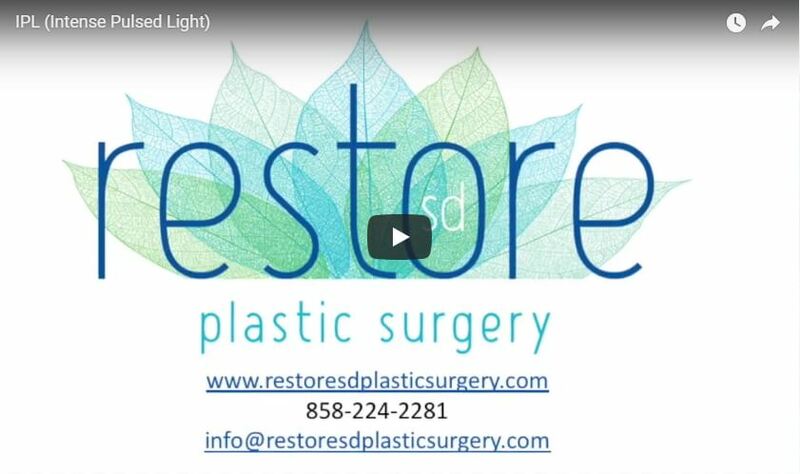 Please come see us at Restore SD Plastic Surgery to learn more.